MADISON, Wis. (CNS) — It was a birthday party unlike any other. Those words from Msgr. 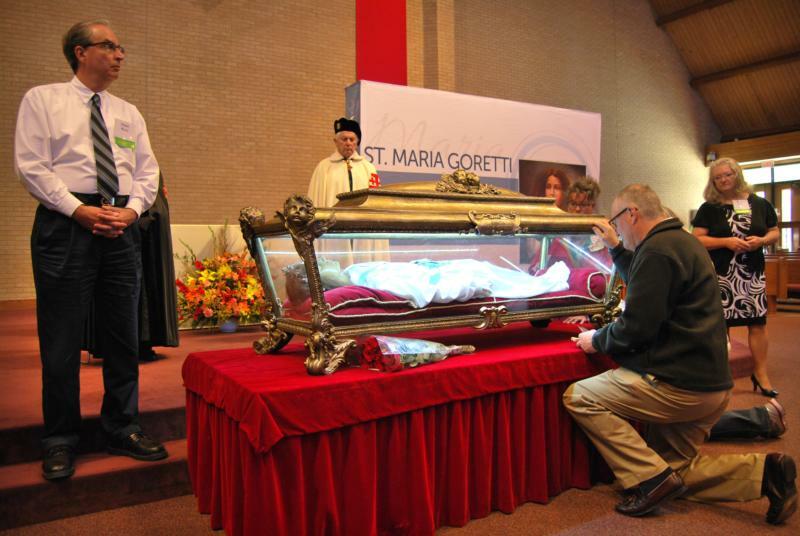 Michael Burke, pastor of St. Maria Goretti Parish in Madison, are the simplest way to sum up the 24-hour period in which the relics of St. Maria Goretti were at the parish church from the morning of Oct. 16 — the 125th anniversary of her birth — to the morning of Oct. 17. More than 13,000 people took part in venerating her relics. From September to November of this year, the major relics of St. Maria Goretti are making a pilgrimage to the United States in what is called the “pilgrimage of mercy” — an effort to prepare and catechize the U.S. for the Year of Mercy beginning Dec. 8. With his parish not originally on the schedule, Msgr. Burke personally contacted Father Carlos Martins and Treasures of the Church — a ministry that gives people an experience of the living God through an encounter with the relics of saints. He told Father Martins, who is leading the relics’ pilgrimage, of the large number of children at the school and in the parish’s youth ministry program. The church named for St. Maria Goretti — patroness of youth — was added to the schedule. The relics — the remains of the saint inside a wax statue likeness enclosed in a glass and metal casket — arrived at the church in the early morning hours. Before a Mass for children and their families, pallbearers from the parish carried the relics out of a vehicle and touched them to a statue of St. Maria Goretti outside the church — making it a third-class relic. While Mass was being celebrated, members of the public began to line up in the parish hall for public veneration — which would begin after the children and families had their time with the saint. Pilgrims from the Diocese of Madison, as well as other Midwestern states and from as far away as Colorado, would come to venerate as the hours went on. “I can’t wait to touch the casket that holds her. It’ll be amazing!” said an excited 11-year-old Claire Seifert from Sauk City. “I think it’s a big deal … something once in a lifetime,” Lois O’Connell, from Black Earth, told the Catholic Herald, Madison’s diocesan newspaper. As pilgrims waited in line, they had the opportunity to learn about St. Maria Goretti, her repentant killer Alessandro Serenelli, and relics in the Catholic Church via information banners. The morning hours had some of the longest veneration lines — wrapping around outside the church building. These people had to wait about an hour in line to venerate St. Maria Goretti. The line moved at a steady pace, with several people pausing around the casket at once and adhering to a 15-second time limit. Following veneration, people received a St. Maria Goretti prayer card and one of Serenelli — both third-class relics, meaning they had been touched to relics, respectively, of the saint and Serenelli. At one point, more than 900 people an hour were going through the line. “It was pretty nice. We all got to touch holy items to the (casket). … It was a once in a lifetime experience,” said James Staples, a senior at St. Anne’s Academy in White Bear Lake, Minnesota, which is a four-and-a-half hour drive from Madison. “Once in a lifetime” put it lightly for one of the teachers from St. Anne’s Academy — Sister Maria Goretti, who was able to venerate the relics of her patron saint for the first time. While pilgrims venerated, confessions were heard by sometimes three or four priests at a time. In the evening, Madison Bishop Robert C. Morlino celebrated a pontifical Mass honoring St. Maria Goretti. Serenelli, who repented his crime while serving 27 years in prison, later entered a monastery. He was present for Maria’s canonization by Pope Pius XII in 1950, at which time she was presented to youth as a model of chastity. She is still the youngest person to be canonized by the church. Editor’s Note: A full schedule for the relics tour can be found here.